This week has been a little slow for us as far as cooking and posting. I came down with something, or maybe its just allergies acting up, but Monday morning saw me up and at the doctor bright and early. Some tests were run, some meds were prescribed and I was sent home and told to go back to bed. Not gonna argue with that. Mrs. G, the wonderful wife that she is, came home from work Monday night and made me some home-made chicken noodle soup. That would have been a great blog, but I never got off the couch. Don’t know how she prepared it, and she probably doesn’t either as she wasn’t working off a recipe, but man was it good! And I think it did the trick! Knowing that I wasn’t 100% Tuesday and wanting some “healthier” meals for the week, I decided to grill up a bunch of chicken breasts. I got the idea from Kerri Tipton of DR Fitness Systems who writes a blog and one of her post called Confessions of a Power Cooker where they cook all their meals for a week on Sunday and vacuum seal them. This gives them quick and healthy options to eat all week-long rather than stopping for fast food on the way home when they are tired and don’t feel like cooking. For us, 4 chicken breasts are quite a bit of food. 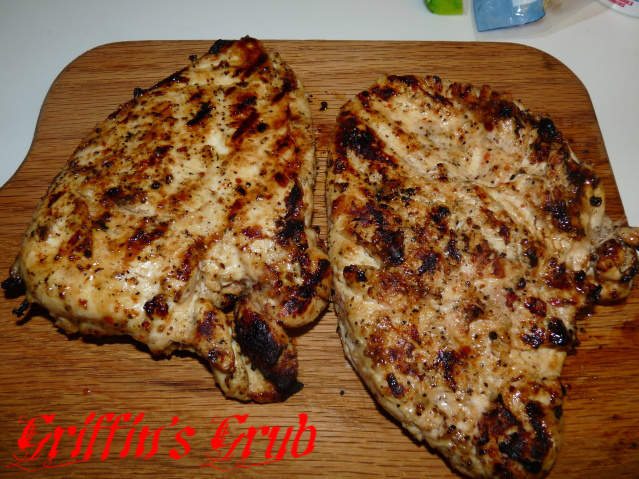 I took the 4 chicken breasts and pounded them out flat so that they would cook quicker and more evenly and would not dry out on the grill. 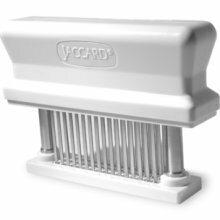 I then took my jaccard ,which is a meat tenderizer, and used it to perforate the meat hoping that in the short amount of time I had to marinate the chicken that it would get down into the chicken and make it more flavorful. Two of the chicken breasts were marinated in Zesty Italian dressing and a few teaspoons of Fiesta Fajita Seasoning and the other two were marinated in Lou Malnati’s Sweet Vinaigrette, which was a present from my secret santa on GreenEggers. I allowed the chicken to marinate until my wife got home, which I think was about 3 hours and then I tossed them onto my Big Green Egg at about 400 F. I did not use any wood for smoke this time, just going straight over the lump charcoal. The fajita chicken got some more of the seasoning sprinkled on top as it went on the grill and then later as it was flipped to give it a bit more flavor. The two on the left were the fajita chickens and the two on the left had Lou’s marinade. Not sure how long these took to cook, but not very long. And knowing that two of them would be for later on in the week and would need to be reheated, I did not want to dry them out. For that reason, I cooked them until the internal temperature reached 160, counting on them carrying over to 165 as they rested. The fajita chicken came out great, wasn’t dry at all, although I think it could have used a little more of the seasoning. Unfortunately, I did not get any pics of our fajitas. Hey, I blame it on still being a bit under the weather. 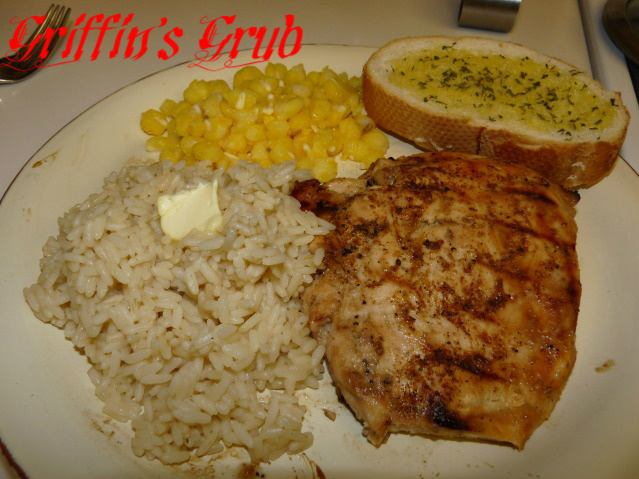 Wednesday night, we served up the remaining chicken along with some rice that Mrs. G made up (using chicken broth instead of water), some hominy and some garlic bread. I’ve never had hominy before, other than in a soup, and let me tell you…I am not really that big of a fan. The chicken was ok, nice and juicy, not dried out, but I really wasn’t digging on the Lou Malnati’s as a marinade. 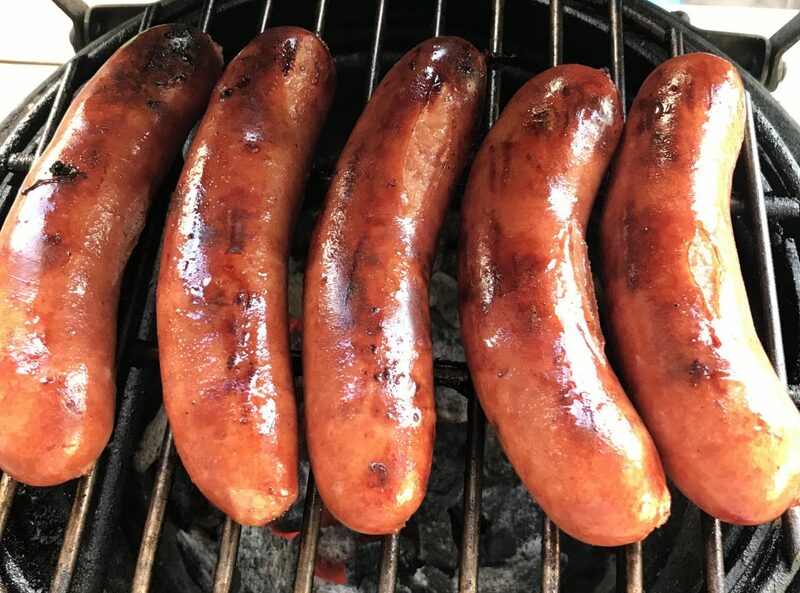 I thought it was way to sweet, so I dumped some of Big Al’s Hell From Texas Rub onto it to give it a bit of heat and that made a world of difference. Not the most exciting meals of the week, but hey…I was sick. And I have managed to drop some weight since Monday when I went to the doctor. Whether that’s from being sick and the meds, or from eating less and eating better, who knows? And we still have about a cup or so of diced up chicken that we can chop up and add to a salad tonight….although something not so healthy and not so chicken sure does sound good right now…. 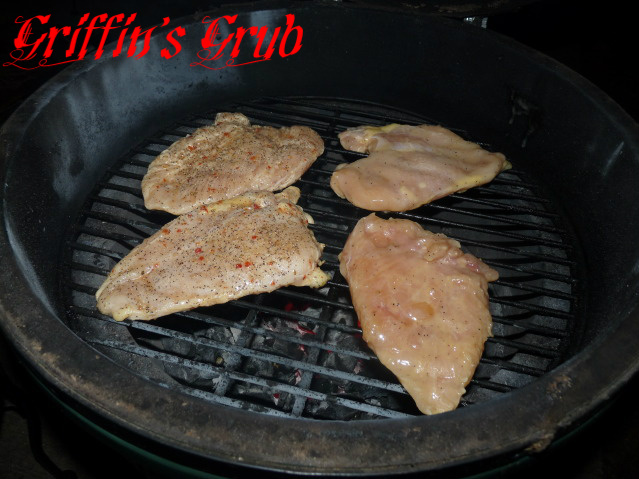 We often gill up a few chicken breasts and keep them handy for an easy week night meal, always nice to add some chicken to a salad or a quick soup or fajitas….. Just started following your blog, I like your style! Hope you are feeling better now! This is my first time to your blog. I liked your Fb page so I can keep in touch. Thanks, Shelley. I’ll hover over my wife’s shoulder next time she makes chicken noodle soup and blog about it. Nothing cures like chicken noodle soup. Looking forward to checking out your blog some more. I really have to pick up a jaccard. Do you have to small one (16 blade) or big one (48 blade)? Think I want to big one but I only see the small ones in retail stores here. Not sure, I’d have to look at it more closely. I’d say its about 6 inches long, if that helps.